Home » Gentlemen » They say ‘y’all’ in these here parts. UPDATED. Texas is the land of ‘y’all’. I’d like to think I fit in when it comes to use of the local colloquialism, but I know I don’t because everyone still refers to me as “the California gal”. A while back I wrote a post about a few of the colloquialisms found around the country, We Say Dude In These Here Parts. It was prompted by both my fascination with local colloquialisms and a friend visiting California from Meeneesooota. Words you’ll need to know when coming to Texas. ‘Y’all’ is a conjunction of “you all”. Not usually said to an individual unless referring to that person’s family (who may not be present at the moment). ‘All y’all’ is the plural of the above. Whataburger is a very popular fast food restaurant here in Texas. Regardless of how the word looks, it is pronounced – very quickly – ‘Waterbuger’. It took me a month to figure out what they were talking about. Beall’s a department store, like a cross between Kohl’s and Macy’s, is pronounced ‘Bell’s’. The “a” is ignored. San Antonio is referred to as ‘San Antone’. It was like that in Malibu, too, the locals called it ‘Bu’. There’s a town near Rockport spelled Tivoli, like the city in Italy. However, it is pronounced ‘Tyvoli’ or ‘Tyvola’. There’s another called Refugio, but it is pronounced ‘Refurio’. With a second “r”. Boerne – I’ll give you a second to guess at that one. Ready? It’s pronounced ‘Bernie’, like the man’s name. You are now ready to ask for directions in Texas. That’s a common greeting in California – to a group of any gender. Although, I probably wouldn’t say it to a group of just women. “Hi, Guys” is also a salutation I use when composing a casual email to a group of friends and family. Or, at least it used to be. I’m going to stop using it now so as not to offend my Texas friends. I giggled. Then I realized he was serious. As a demonstration, I pronounced it the way them “Damned Yankee” west-coasters say it, ‘aksent’. Then I said it again, in my best imitation of a southern ecksint. Not sure if he heard a difference. Maybe I sound like a Texan. The gentlemen call every woman “ma’am”. ‘Yes, ma’am. No, ma’am.’ This. makes. me. swoon. It did NOT make me swoon in California, or even Arizona, because it always said by some polite teenager in deference to our age difference. Not so in Texas. They’re just polite no matter what you’re age. Texans are genuinely kind and polite folks. How to drive in Texas. Fast. That’s it. Drive fast. The speed limit is 70 mph on most highways, and 80 mph on the others. Polite. Texans are also very polite on the road. They respect other driver’s need for speed and will drive on the shoulder so you can pass. Yes, they all do this. A friendly wave is appreciated in return, or a flash of the tail lights. 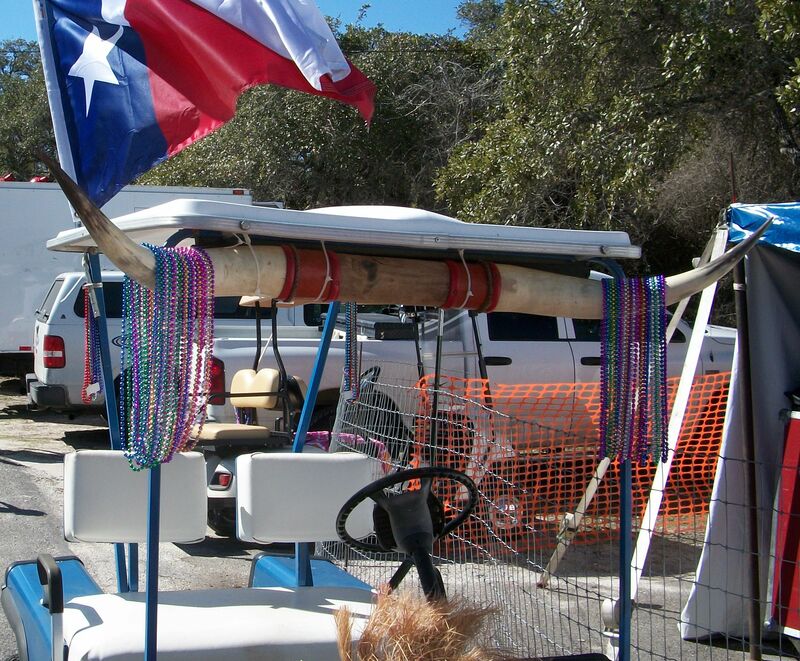 Of course, if you have a golf cart, it should look like this… I’ve seen quite a few golf carts decorated with longhorns. Longhorns on a golf cart. Not rare in these here parts. Winter Texans Are Snowbirds, Too. “Winter Texans”, as they are known here, are really just RV snowbirds who spend their winters in Texas rather than somewhere else, such as Florida, Arizona or the California desert. As far as I can tell, everywhere else in the U.S. and Canada, people living the winter RV lifestyle are called snowbirds. I think Texans allow them to be called “Winter Texans” as a consolation prize since they’re never going to be real Texans no matter how many winters they spend here. So, I’m a Damned Yankee Winter Texan who fergot to leave when the season ended, also known as “that California gal”. But they say it with a smile because they’re very polite. I have more than a few readers from Texas and I’d love to hear from y’all in the comments. What is it that makes Texans so proud and protective of their state? What other colloquialisms have I missed, or misused? UPDATED: I forgot important storm lingo. How could I forget storm lingo? OMG. You’ll need to know “TORCON”. While I don’t know exactly what it stands for, I do know it’s got something to do with the severity of impending tornadoes. This is very important. The word is shown on the weather news with a fraction next to it. A TORCON rating may be displayed as “4/10”. This seems to mean there’s a 40% chance of a tornado in that area. If you see a TORCON rating of 6/10, let’s say, I’d run for the hills. Also, while driving the highway if you see a little swirly thing painted on the outside lane, it means this is not one of those lanes you can use to move over for faster drivers. It’s for running from hurricanes. Do not use this lane unless there is a hurricane behind you. I’d say you are now ready for the Texas storms, but I’d be lying. You’ll never be ready for the Texas storms. They still scare the crap out of me. Howdy, Jana! I feel like I know you, too, especially since I found out you have FOUR cats. *bows with deep respect* Are you in South Texas? Is Hill Country considered south Texas? Geez, I should’ve met up with you while I was there! I love it when a man opens the door for me. I see it as a sign of respect.But I never know when I get to a door first if I should wait or if that looks lame. I feel like it might look lame so if I’m there first I just open it. I don’t know the proper protocol. It’s interesting to see how long they keep it up (the door opening thing). I’ve noticed while dating in California not all who start out doing it continue for more than a couple weeks of dating. Then they either give it up, or do it sporadically. Ah, the Damn Yankee sense of humor… that varies widely from east to west coast of the country. The folks on the east coast have a wickedly funny and sarcastic sense of humor. Having been born on the east coast to parents from New York, I’ve got it. But Californians in general don’t seem to care too much for it. No, no no. Texas has very defined regions. You have West Texas, but that is subdivided into near west, far west southwest, the Big Bend, the Panhandle, the caprock and the Llano Estacado. East Texas has the piney woods and the bayou country. North and south are pretty much just that, but the Hill Country is a whole ‘nother place. Nothing like it in the world. Well… you asked for it. A guy is a guy… as in a dude, afella, a stud (sometimes), etc. Now I’ll address a couple of omissions. The word “yet” when pronounced “ya-et” is actually a question. Someone is asking if you’ve had dinner. And dinner is the noon meal. You eat supper at night. “Right smart” is not some sort of intelegence measure. It is a measure of size or amount. When you have your dinner and Stella takes your order for that chicken fried steak, you tell her to make sure that Charlie piles on “right smart” gravy, and be sure to cover the taters too. I love it! These are great – and important – additions. Thanks MB! Had to Google “Cotton Eye Joe”. Well, let’s just say I don’t know how – yet. Oh yeah. She is from “up north” and she’s forever admonishing me for my Texican utterances… but then the next thing you know she says the same thing the same way. I’ll break her in yet. Ain’t that a hoot? LOL! ‘LBJ slang’ I love it! Becky! How the heck are ya?! I sent you a message about sitting you pets and place for you, but never heard back. Still need a sitter? Ok, so I’ll have to be more careful about not getting my own door sometimes, and stepping back if I’m in the way. I LOVE it when someone opens my door for me, it feels respectful. I don’t think I got the ‘sitting’ message, but now I know! I found out something interesting you might like. I know someone who has a child who requires subQ injections 2X daily, and to prevent ‘trauma’ they have a simple ‘tiny’ permanent ‘port’ on the child’s back where it can’t be reached, but prevents future sticks. If you come to a point where you needed one for your cat, you could consider the spot at the back of the neck/back of head if necessary. I lost my greyhound buddy yesterday at age 14 due to inflamation of age-related constricted airway. Not a good day. I WILL probably be badly needing someone to ‘occupy’ my driveway and pet-sit a little bit later! I had put off ‘planning’ it because of Rio’s breathing condition, and begun some needed upkeep on the house, etc. Now that Rio has passed over the rainbow bridge, I feel better about leaving home for a while! <> I am subscribed to your updates, and with you were here now. (Small town rodeo brings in area cowboys tonight til Saturday night with other fun-related activities! There will be a ‘county fair’ in a couple of months, so I’ll let you know!! I love your blog, but wish you would post more often! LOL I’m glad you are enjoying yourself, and will hope to see you sometime soon!